Ben & Jerry’s has joined forces with Mission Australia to bring some of Australia’s favourite bands centre stage to raise funds and awareness for charity, and create the best ever Sundae Sessions at the annual Ben & Jerry’s Openair Cinemas. This weeks Sundae Session will take play on Sunday 17th February with Pear Shape and Tokyo Denmark Sweden rocking the Ben & Jerry’s Openair Cinemas stage and the movie Top Gun playing afterwards. All ticket proceeds from Sundae Sessions go to the good people at Mission Australia, a community service organisation that has been transforming the lives of Australians in need for more than 150 years. Working together they strengthen families, empower youth, strive to solve homelessness and provide employment solutions. Regular Sundae Sessions will continue every Sunday throughout the sunny season until the 3rd March. The event sets sail at Bondi Beach, with tub-thumping moo-sic from local bands every Sunday, which fans can enjoy whilst tucking into some free dairylicious Ben & Jerry’s. It really is the ultimate way to get into the spirit of summer and come together with friends to chill out under the sun until the stars come out and movie magic begins. 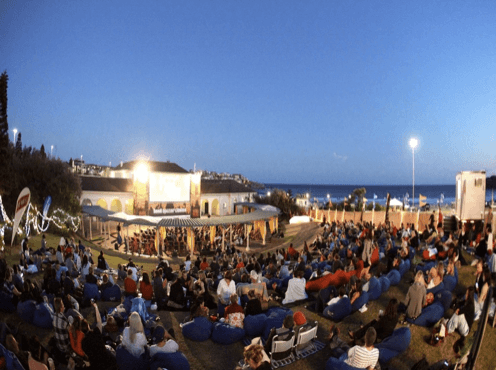 Ben & Jerry’s Openair Cinemas is a quintessential summer event that features a great mix of classic and recent blockbuster movies playing on a huge outdoor screen from dusk. Movies include Pitch Perfect, Wreck-it-Ralph, Top Gun and more! Music by day, movies by night, cinemagoers and music lovers alike can relax with gourmet-style food and tasty beverages from the licensed bar, and hear the sunset sounds of acoustic sets from talented musicians. Key dates are outlined below, so get moo-ving and jot those delicious dates down in your dairy!